The Fijians are now second on the overall Series Standings following the defeat with 142 points, three behind leaders USA. They include forwards Josua Vakurunabili and Meli Derenal­agi alongside Winger Aminiasi Tuimaba and rover Vilimoni Botitu. Gareth Baber’s team will travel to London on May 25-26 where they will face Pacific rivals Samoa, France and Kenya in Pool B. The series will conclude in Paris a week later on June 1-2. The 20-year-old Derenalagi has been a revelation since debut­ing for Fiji in Dubai last year. He currently leads the series in off-loads (31) and scored two tries in Singapore, taking his tally to 10 in the overall Series. Baber will hope Derenalagi can once again hit top form in London and Paris as he eyes his first overall Series title win as coach. 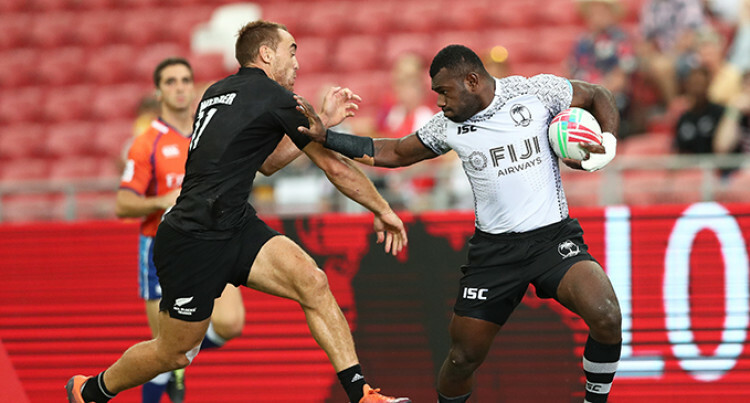 Vakurunabili had his best performance in a Fijian shirt at Sin­gapore, scoring four tries which was just one shy of his tally at the previous seven tournaments combined. Baber needed the forward to step up after losing Kalione Nasoko and Mesulame Kunavula, and Vakurunabili more than delivered. His hard running and slick ball handling skills proved a hand­ful for Fiji’s opponents until the collapse in the Cup final. Tuimaba, who leads the scoring charts for Fiji with 32 tries in the Series so far, scored five times in Singapore and was a con­stant threat. He was culpable of losing possession in the final play of the Cup final in Singapore with Fiji trailing by one point, but the stats show his influence has been vital this season. Fiji’s best attacking player will need to quickly put that mo­ment of madness behind him and focus on the European leg of the tour. Versatile rover Botititu is seemingly able do it all. He scored two tries in Singapore, increasing his tally to 19 for the season. Seremaia Tuwai’s injury meant Botitu was moved to playmaker on day two in Singapore and unsurprisingly excelled in the role. His 17 tackles, 7 off-loads (31 in the season), 19 carries and one line break earned him fourth spot in the DHL Impact Player standings. Botitu’s work ethic is second to none.